Tempe Diablo Stadium in Tempe, Arizona is the Spring Training home of the Los Angeles Angels of Anaheim. That's the only team that uses this stadium, unlike some other local stadiums where two teams share the facility. Tempe Diablo is not used for Fall League Baseball. For Arizona Rookie League baseball, the Tempe Angels do not use this stadium; they play at the Angels' minor league complex about half a mile away near the Phoenix Marriott Tempe at the Buttes. During Spring Training Baseball season, the team does not practice inside the stadium. However, there are practice fields in the complex here. There are no assigned seats for practice sessions, and they are free for the public to attend. 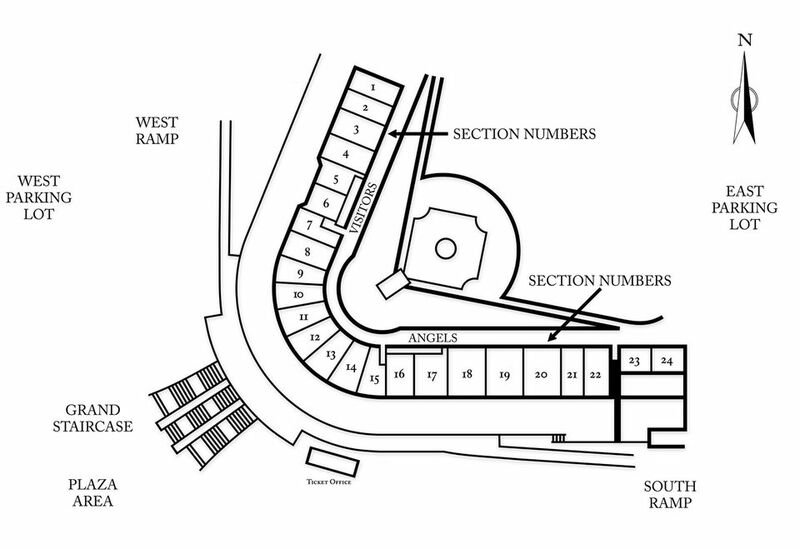 Use this stadium seating chart to determine where your seats will be at Tempe Diablo Stadium. There is no one section for accessible seating; those seats are sprinkled throughout the stadium. The stadium has a rather simple layout, as all the seats are on the same level (no upper deck). The view is great from everywhere! Although it isn't shown on the seating chart, there is a some berm (grass) seating area in left field. This is the only Cactus League Stadium that has a line on the concourse behind which anyone standing there must be situated. That's because standing on the concourse here is very popular, especially on warm, sunny days when the seats don't afford any shade. Take a look at some pictures of the stadium where you can see sunny vs. shady areas, and read these Tempe Diablo Stadium tips before you buy your tickets. To see the image above larger, simply temporarily increase the font size on your screen. If you are using a PC, the keystroke to us is the Ctrl + (the Ctrl key and the plus sign). On a MAC, it's Command+. There are 10 Cactus League stadiums in the Phoenix area where the 15 MLB teams play Spring Training Baseball. You can see the other Spring Training ballpark seating charts here. Where Are My Seats for Spring Training in Peoria? Where Are Your Seats for Surprise Spring Training? Where Do the D-Backs Farm Teams Play?